When assessing the health of the labor market the Fed knows what we know…the BLS report headlines have been rendered useless. So the Fed directed their research department to give them a better yard stick to measure the jobs market. What they got was the Labor Market Conditions Index. The Fed created this index to get a better handle on the true state of the labor market. You may wonder why they would feel the need for a new index when we have the Employment Situation Report. The answer shows how far ahead of the curve Blue World is! This report is “unofficial,” yet gets lots of attention from the Fed because they realize what Blue World’s reports have been saying for years; the unemployment rate is artificially low! Wouldn’t ya know that the detail the Fed research department looks at to create this index very closely matches the Blue World analysis! (High 5 us!) They did a lot of work for nothing…they should have just been reading us! Note from the graph that in 2012 the index was near 12, and there was no serious talk of a rate hike then. The index has plummeted since, only recovering to about 8 in the succeeding years, and averaging only 1.4 for all of 2015 with two consecutive months below zero. Even the highly touted, monstrous report from October with its upward revision was only able to move the index from 1.6 to 2.2. This is why dovish Fed principals are saying it is not time for a rate hike yet. They’re right! The problem is that the pressure is making it harder and harder for them to resist. We hope they can hold out. We can’t figure out which medium sized Central American economy she’s talking about, but we think they’re gonna get a rate hike! Mixed…again and that’s better. There is a lot going on here including some really confusing comments from Fed Chief Yellen. Let’s dig in. The unemployment rate is steady again at 5%, and who cares. We know why that is irrelevant. (If not, please review any number of prior posts from our archives) The private sector added a net 197k with government payrolls contributing 14k to make the headline total of 211k. The Participation Rate ticked up a tenth to 62.5. That is still ridiculously low, but up is up. For comparison it was 62.9 in November of 2014, also ridiculously low, but now a rate hike seems more likely than it was then. Go figure. The Labor Force grew, the number of unemployed grew, but the Not in Labor Force total has now fallen for two months in a row. Perhaps a hollow victory right now as the number is still 94.5M, and that is 2M higher than November of 2014, but hey, we have to start somewhere… A lot of Weird numbers to be sure, but we’ve gotten used to that. One of the most notable figures coming out of this month, however, was the number of those at work part-time. The BLS tracks three stats here. Those at work part-time because they want to be, those who are part-time due to not enough work to do at their jobs, and those who want to be full time but can only find part-time work. The latter two come under the heading of Part Time for Economic Reasons. That number jumped by 319k in November. Usually we’d talk about wages and hours at this point, both uninspiring, but everyone is most concerned with what the Fed will do. We still have a lot of data to come before the meeting, and Blue World does not believe the data has or will support enough strength for a hike. 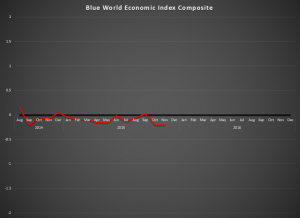 For a little more detail on that, have a look at the Blue World Economic Index™ for November 2015. But if we are looking for anecdotal evidence of what they’ll do there is some available. Last month on WBBM in Chicago Matt talked about the Chicago Fed President, a dove, said he didn’t believe it was time but he would not dissent at the next vote. BUT the big one was from Janet Yellen herself, yesterday, when she said it takes fewer than 100k jobs to cover new entrants and anything above that cuts into the existing slack. We are having difficulty deciding which statements are more absurd; the nation is at full employment with a sub-63% Participation Rate, and 94.5M Americans not in the labor force or that the United States Economy adds fewer than 100k eligible workers per month!! Sounds like a Fed that is bound and determined to raise rates in spite of the data! 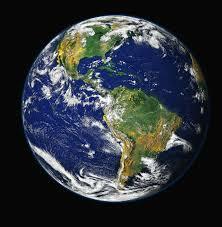 Prior to now Blue World has said we believe there is well below a 50% chance for a hike. Based on Ms. Yellen’s comments and several other anecdotal points, we now believe we are better than 50% likely for one…and we’re not ready. 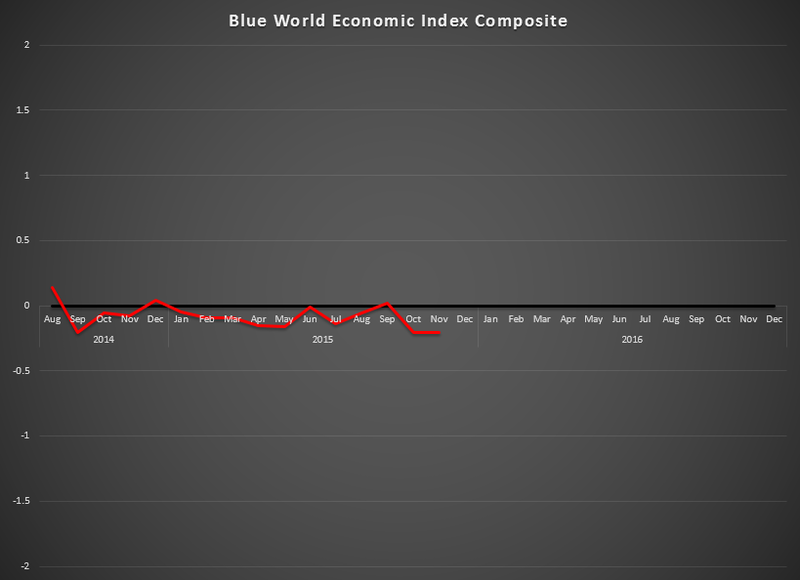 The Blue World Economic Index™ was essentially flat in November 2015 ending at -.21. The biggest drop was in Consumer mood falling .15 from .53 to .38 since October and the most improved was Services up .17 from 0.0 last month. The economy remains listless with demand weak and consumer mood waning a bit. We don’t know what the Fed will do with rates but there are lawmakers from both parties lobbying hard against one. We agree. A rate hike happens in response to an accelerating economy in an effort to guard against runaway growth and the associated problems with inflation. There is no clear evidence of either so a rate hike now would be imprudent. Every effort is made to ensure accuracy of data transcription but accuracy cannot be guaranteed. The official release sites should be cross referenced. The analysis represents the opinion of Blue World Asset Managers, Ltd. who does not warrant or guarantee predictions based on its analysis.